I hate coffee (I know, it’s me and three other people over the age of 12 in the United States). Actually, I don’t have anything against coffee; I just don’t care for it. I also don’t like licorice or bell peppers. I’ve learned to work around all three when I am eating someone else’s cooking. I don’t make a big deal out of it, but I pass on coffee with dessert, and I always leave the green pepper chunks discreetly on my plate. Everyone has something that they don’t care to eat. I use to ask people coming over for dinner “what do you like?” They invariably said, “Oh, I’ll eat anything,” and I end up making the one thing they absolutely detest. So now I ask, “What do you hate?” – and they tell me. It makes preparing a menu much easier, believe me. We used to have a friend (who is no longer in the picture) that had this absolutely childish aversion to seafood. Wouldn’t eat it; wouldn’t consider eating it; and made unnecessary comments if someone else was eating it. In fact, his wife told me she had to throw out the Worcestershire sauce after he found out it contained anchovies. Like I said, a completely immature attitude about it. I try to be attentive when someone tells me they don’t care for something. I would much rather alter my menu plans than intentionally serve someone something they don’t like. Same goes for people with allergies, people with moral aversion to eating meat, diabetics, and such. But sometimes you just need to secretly tweak someone who makes a big deal out of hating a particular food. I can admit this now: After his wife told me about the Worcestershire sauce, I used to sneak anchovy paste into anything I could when I cooked for this friend. I know – it’s mean. No one else knew about it at the time, just me. It was my own little secret revenge because he was such a big baby about it. I would snicker every time he would rave about the macaroni and cheese (by the way, anchovy paste is an AWSOME addition to cheese sauce! I still use it when I make mac and cheese). It didn’t hurt him, and it made me feel a little better about having to put up with his grousing. Do I feel guilty about the anchovy paste? I used to, just a tiny little bit – then my guilt was lifted. I told you that he wasn’t in the picture any more. That’s because he and his wife went through a rather ugly divorce – one where someone was definitely at fault. Needless to say, my newly single friend was distraught, and I was trying to comfort her so I decided to tell her about my secret little revenge. I’ve never seen someone turn from tears to laughter so fast in my life. It just goes to show you: a little revenge is good for the soul. Think about what Bo Peep would have done to those wayward sheep once she got her hands on them. Which leads me (although rather awkwardly) to this dish. I’ve mentioned my love for lamb before, but lamb isn’t the healthiest selection of meats. Because of that, we eat it rather sparingly around our house. Luckily, with Passover around the corner, lamb shanks were on sale. (I’m very ecumenical when it comes to bargains.) I also had 4 different kinds of greens in my CSA haul that I was trying to figure out how to use. I like lamb and cannellini beans, and I like beans with greens, so I just decided to throw everything together. It simmers for a couple of hours, so it’s low maintenance, and the lamb imparts so much flavor to everything else that it tastes much more upscale than it’s peasanty origins. I used canned beans for this because I could not find dried cannellini beans anywhere. Of course, I could have used dried navy or great northerns, but I like the creamy texture of the bigger cannellinis. If you choose to use dried beans, just soak them overnight and add them at the beginning of the braising. You’ll probably have to go back and add some additional water as well. At the last minute, I decided to throw a little acid in the pot. Boy, did it make a difference! Just a tablespoon of red wine vinegar really highlighted the robust flavors of the lamb and cut through some of the creaminess of the beans. Besides, vinegar’s always good on greens. And I have to say that I’m torn – leaving the shanks whole makes a much nicer presentation, but stripping the meat and throwing it back in the pot makes it much easier to serve. Do whichever you want. But the next time someone frustrates you with their unnecessary dietary demands, find a way to exact a little harmless, culinary revenge. It does wonders for your mood. 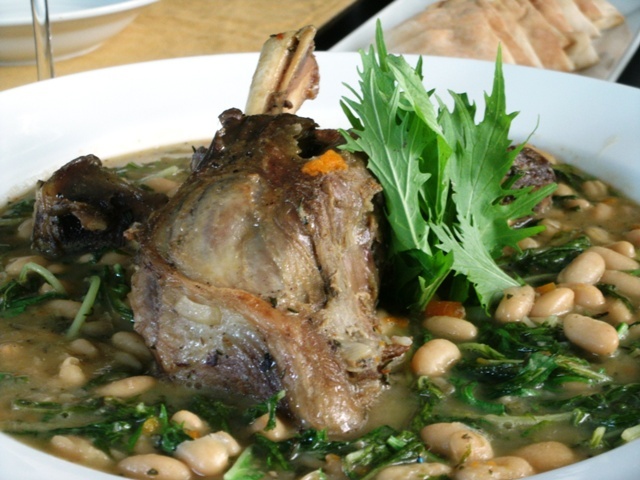 Hearty beans and greens accent earthy lamb shanks for a great family meal. Preheat large Dutch oven over medium high heat. Salt and pepper lamb shanks to taste. Add 4 T olive oil to Dutch oven and sear lamb shanks 5-6 minutes per side until browned. Sauté 5-6 minutes, until onions are translucent. Add garlic, red pepper flakes, salt & pepper to taste. Sauté 1-2 minutes. Add enough water to cover ¾ of the lamb shanks. Add bay leaf, rosemary, and thyme sprigs. Bring to boil, cover, and reduce to simmer. Simmer for 1 ½ - 2 hours. Remove lamb shanks and reserve. Remove thyme stems and bay leaf, then discard. Add cannellini beans and bring to boil. Stir in greens and cook until wilted. Remove from heat and add red wine vinegar. Return meat to the pot to serve. Top with extra virgin olive oil and parmesan cheese, if desired. Note: Removing lamb from the bone before returning to pot will make for easier serving. This entry was posted in Cooking and tagged beans, dinner, greens, inexpensive, lamb. Bookmark the permalink.